The notification leads to a page that will allow the Admin to respond to the question, similar to the way this worked on the old F180 dashboard. NOTE: Old FAQ’s will STILL be there! User sees a message: "One or more users have submitted an FAQ." 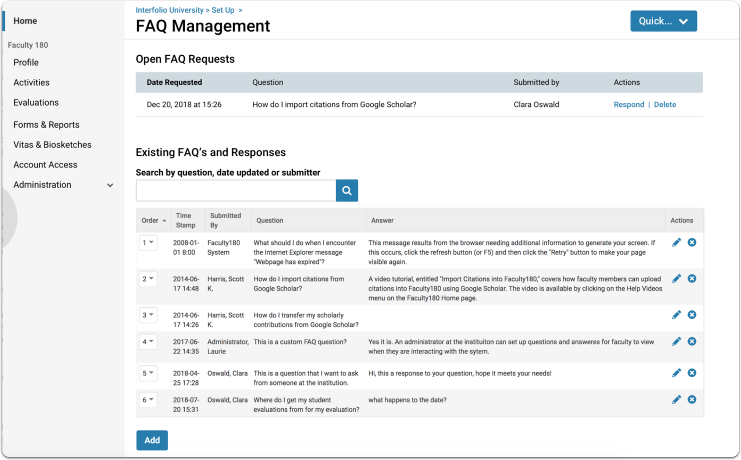 When a user submits an FAQ question, an F180 administrator logging into Interfolio will see an action item that says "One or more users have submitted an FAQ" when they log into Interfolio. When there are no unanswered FAQ's, the Open FAQ Requests section wil not display. Once there are no more FAQ's, the Open FAQ section will disappear and the notification on the home page will be removed. By request we have added the ability to do a bulk export of annual review documents for all units, organized by evaluation process. This is a new report and new functionality in F180 reporting. For more details, see this article on exporting annual review documents organized by evaluation process. Fixed issues with ordering not working when items were removed from the Admin's FAQ Configuration page in the Existing FAQs and Responses section. The work item now displays on the Admin's Home after a faculty member submits a question. Popup displays after the faculty member submits a question: "Your question has been sent to administrator at your school. You will be notified once an administrator has responded"
Administrator with Report rights (and not Full Admin rights) in a given unit generating a report and clicking one of the hyperlinks in the "Totals" row, will now correctly see the drill-down results for the "Totals"
Fixed issue with incorrect Date Submitted and the Date Approved on Faculty > Forms & Reports > Prior Input forms. The following changes were made as part of our work with individual clients, but often the changes made here will improve the product more broadly. Administrators can emulate and have the same settings for any custom section created for Profile. 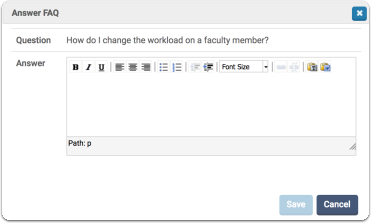 An F180 faculty member can see if I they are restricted from adding, editing, or deleting data in the custom section they are working in. An administrator configuring a vita who is configuring the Scholarly Contributions section and has the Display Style config set to "Traditional," should see a config called "Number Scholarship", which, when set, numbers each citation in the vita output. Fixed a bug where the "Assigned to Unit As" filters in the faculty picker were lost when drilling down on the scholarly activities report. When using the faculty picker to filter the faculty being included in a report, then using the the report (e.g., "Assigned to Unit As", "Exclude Subunits", "Administrators Only", "Employment Status", and all the other subsections in the faculty picker), these filters will be applied on any drill-down version of the report. Custom "Collaborator Report" identifies faculty who have collaborated on previous pieces of scholarship. Before: This was only available to administrators through the standard reports interface (Administration -> Reports). Now: The Collaborator Report is available to faculty through Faculty -> Forms and Reports. We are keep the existing collaborator report for admins. As an administrative report, admins can choose which faculty to pull collaborators for. In the faculty version, faculty should only be able to see their own collaborators. Faculty who are also administrators should use the administrative version of the report to see other people's collaborators.